[May 3, 2016]: There is mounting evidence that both the Greenland and parts of the Antarctic ice sheets may melt much faster than previously estimated. This posses a global threat to a growing, increasingly coastal urban civilization. For more information, see, for example, the discussions in the Washington Post and the New York Times, which refer to the relevant scientific publications. [August 26, 2015]: In an article in the New York Times, W. J. Broad refers to several publications and statements of scientists that underline the severe impacts of the Mt. Tambora eruption in 1815 and the threat such an eruption would be for modern society. [June 24, 2015]: The main outcomes of the Science Position Paper on extreme geohazards were presented in aUnion Session at the IUGG General Assembly in Prague. Comparing extreme geohazards to the impact of modern society on the planet, it appears that humanity is comparable to the most extreme geohazards. The presentation is available as keynote and pptx version. 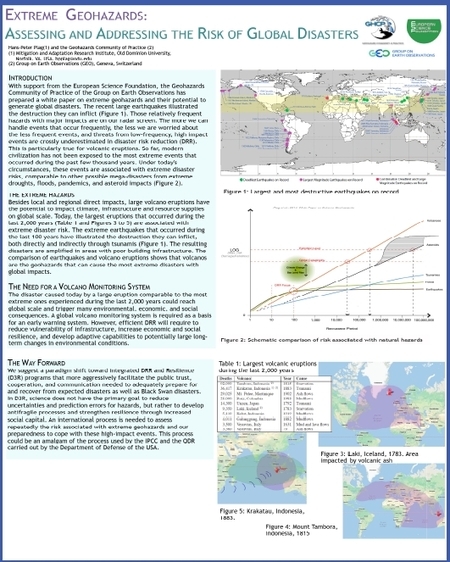 [April 15, 2015]: The Science Position Paper on extreme geohazards was launched in a Splinter meeting at EGU, Vienna, Austria. The Panel included several authors, Topo-EUROPE, UN_Spider, and EPOS. The ESF press release resulted in numerous articles. GHCP Session on Extreme Geohazards at GeoRisk 2012: A session on “Extreme Geohazards: Reducing Uncertainties and Disaster Risk” will be organized by the GHCP at the First IUGG GRC Conference on “Extreme Natural Hazards and Their Impacts” (GeoRisk 2012), which will take place December 8-12, 2012, at Chapman University, Orange, California, USA (see the Announcement for details). 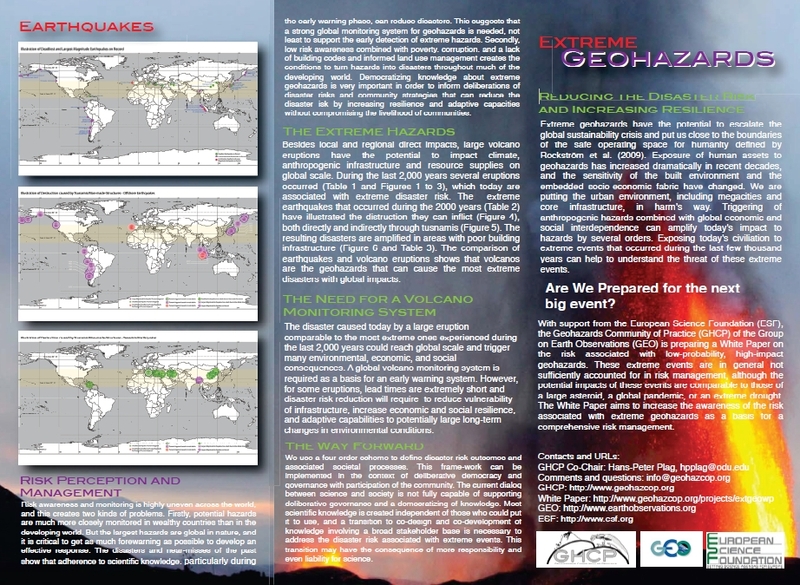 The Community Science Position Paper on extreme geohazards has been published. The paper was launched in a splinter meeting at the EGU Assembly in Vienna on April 14, 2015. For more details see the announcement. At the IDRC 2014, Davos, Switzerland, August 25-28, 2014, a poster on the white paper was presented. A special session discussed various aspects addressed by the White Paper. The GHCP participated in the GEOSS Exhibition co-located with the GEO Plenary and the Ministerial Summit on Earth Observations, held November 1-5, 2010 in Beijing, China. The GHCP presented a poster and was also featured in the COP Brochure. In many regions, geohazards are a major threat to society, costing lives, disrupting infrastructure and destroying livelihoods. Understanding the associated processes and gaining a comprehensive knowledge of the location and behaviour of these hazards is pivotal for risk assessment, hazard mitigation and adaptation, reduction of vulnerability and preparedness. 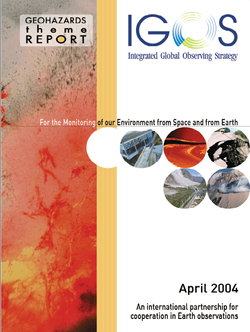 The importance of observing and understanding geohazards to the GEO Disasters Societal Benefit Area (SBA), in particular, in building a successful Global Earth Observation System of Systems (GEOSS) is clear. Communities of Practice support GEO in its goal to provide the observations required to support informed decisions in the nine SBAs. In particular, Communities of Practice are a key mechanism for the linkage of GEO to the users of products and services provided by the GEOSS. 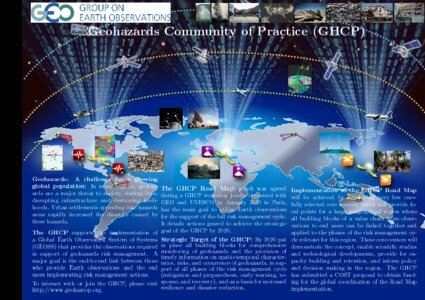 Over the past few years, initial steps have been taken by members of the former IGOS Geohazards Theme Team to make progress towards a Geohazards Community of Practice (GHCP) for GEO. This has been seen in successful initiatives like Super Sites and through a number of GEO Tasks, in the Disasters SBA, in other SBAs and in cross-cutting tasks like the Global Datasets Task. In order to support and build on this progress, a comprehensive review of the current situation and the development of strategies for the next five years is timely. Therefore, together with GEO and UNESCO, the GHCP organized its 1st Workshop on January 18-21, 2010 in Paris (see Workshop Page ...). This Workshop was of interest to the entire GEO and wider geohazards community; space agencies, geological surveys, end users such as civil protection agencies, the key observing systems (geodetic, seismic, magnetic) and the international networks for the major hazards addressed by the GCoP (earthquakes, volcanoes, landslides, subsidence). 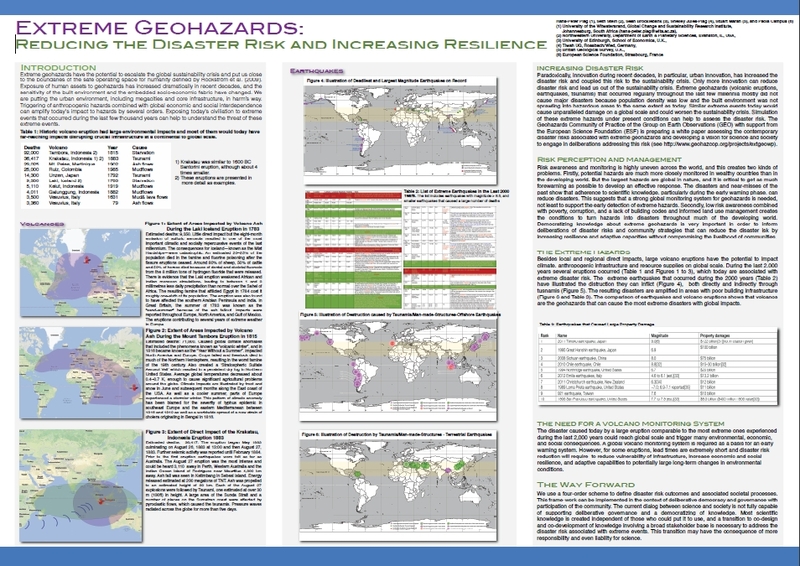 By 2020 put in place all building blocks for comprehensive monitoring of geohazards and the provision of timely information on spatio-temporal characteristics, risks, and occurrence of geohazards, in support of all phases of the risk management cycle (mitigation and preparedness, early warning, response, and recovery), and as a basis for increased resilience and disaster reduction. by developing a global network of very few carefully selected core sites. These core sites will provide focal points for a large geographical region, where all building blocks of a value chain from observations to end users can be linked together and applied to the phases of the risk management cycle relevant for this region. Thus, these core sites will demonstrate the concept, enable scientific studies and technological developments, provide for capacity building, and inform policy and decision making in the region. 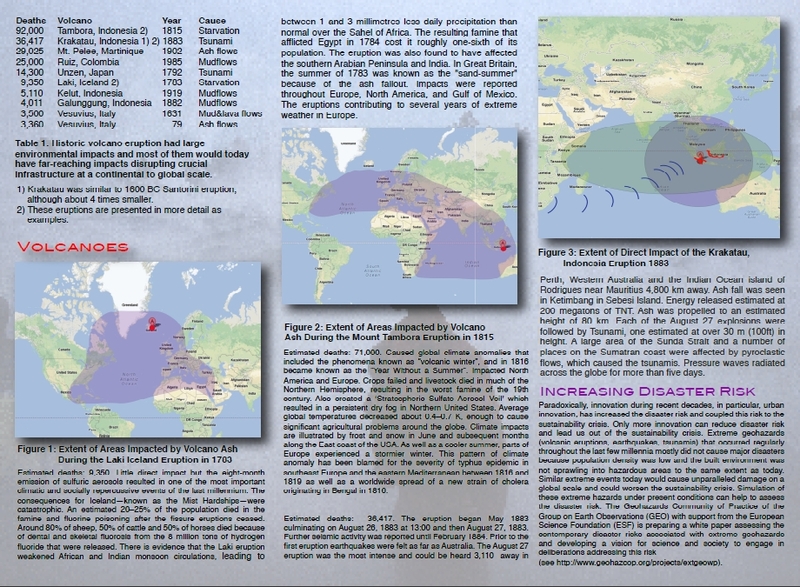 The IGOS Geohazards Theme report is the basic reference document on which the GHCP builts. 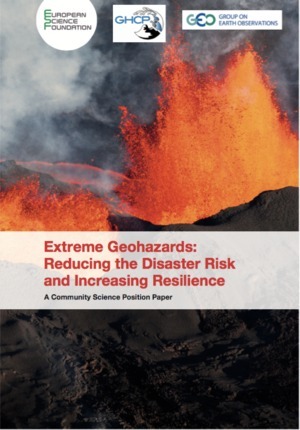 This report comprehensively addresses the observational requirements resulting from key applications concerning the societal impact of geohazards, such as the mapping of geohazards, the assessment of risks resulting from geohazards, raising the awareness, and monitoring hazardous areas and providing timely warnings.